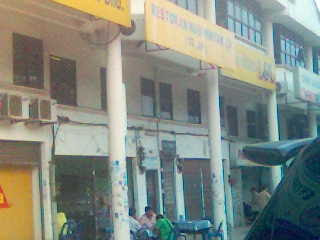 I was travelling from Kuantan to Gambang, one early morning . Hungry and lack of sleep I was determined to begin the day with something nice to taste. After leaving Kuantan town and drove on for about 10 minutes, just before we reached the East Coast Highway.... I turned off. Saw this little shop here with lots of people eating. Many people means good food. So we decided to pull over and investigate. So we went into the shop, and it sold only Nasi Minyak. According to Gretchen's Cookbook , Nasi Minyak is Malaysia's Festive Rice... never knew that, neither have I tasted Nasi Minyak before. 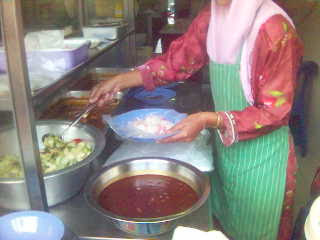 Oh well, been to a few Kenduris, but I don't believe I have tried Nasi Minyak in a shop before. The stall was clean, no flies around the food, I signalled my colleague, lets try this. So when we ordered I had curry chicken to put on my Nasi Minyak. Obviously the other choices are Beef Rendang, Fried Chicken and also Mutton if I remembered correctly. 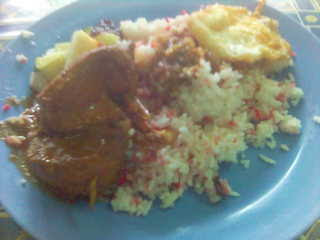 The rice was abit unsual , as it had acar timun like briyani gam, but the rice was different. Instead of the usual heavily spiced rice , you have plain rice with red colored rice ( sweetened abit ). And to top it up, it had Mata Kerbau. Cheap, RM3.50 for that plate and I also ordered my Kopi Campuran Radix for Rm2. I definitely hope to come back here again to try out some of the other dishes they serve there. Its nice, and I wonder why Nasi Minyak has gotten the stigma that it is specially done only for festivities, weddings, etc. That restaurant has something going for them, and I hope they decide to open a branch here in KL, I am sure they will become a big hit over here. 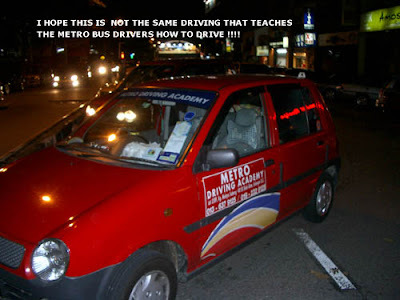 Driving Academy - Learn to Drive in the Real World !! It was one Friday night, after BC class in Uptown, we crossed the road to our cars before we decided what we wanted to eat. Then as we crossed the road, something caught our eye !! 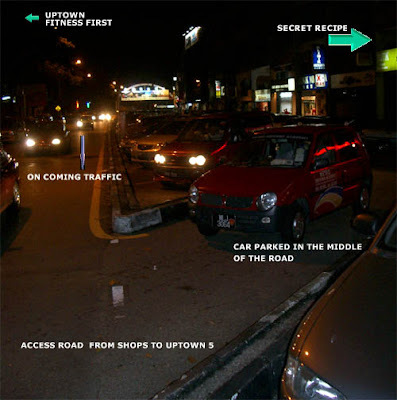 One Red SLK (small little kancil) was parked in the middle of the road, blocking traffic and all. One can only assume that this car belonged to a driving instructor, who teaches people how to drive, and of course they also teach undang undang jalan raya, and to teach their students to abide by traffic laws, right ?